You know how mini-comics can be about anything the artist wants, right? Well, Diana Tamblyn's The Rosie Stories is about her love for her new baby, Rosie. 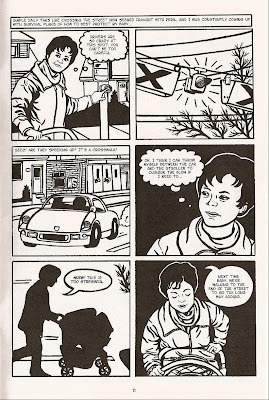 This comic feels so personal and so right with the world, that you start to feel a kinship with Rosie, Diana, and her husband. That's part of the charm with mini-comics; while the big comic publishers push the same old crap on a captive audience, minis and small publishers are free to explore the important things in our lives. 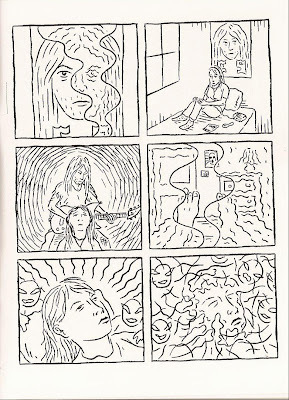 With Diana's new comic, you know exactly where her passion lies (not to pigeonhole her though, she also sent me a neat litle mini that mixes up some single panel pages, Poor Sailor style, devoted to some local musicians). The Rosie Stories is split into four sections and an introduction over 16 pages. It begins with a prelude to Rosie's birth. Diana has the fears, uncertainty, and then the overwhelming joy as Rosie is born. 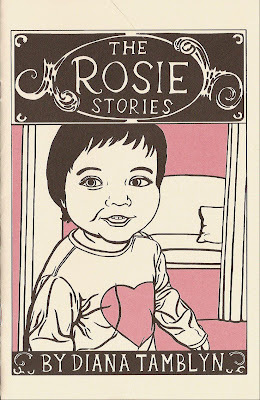 A highlight of the mini to us outsiders are the crazy-cute "Lil Rosie" stories. 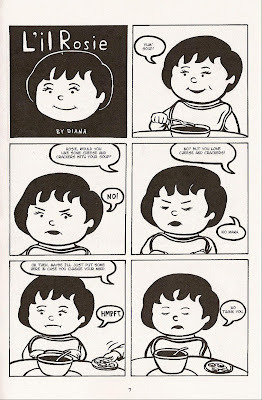 In these two stories, Diana's Rosie reminds the reader of a younger Lucy from Peanuts. She's cute but headstrong. Diana's art is a good mix of bold lines and strong black and white art. Occasionally you feel overwhlemed by her facial expressions and heavy line, but you always know where she stands in relation to ther art. She's never indecisive. I always appreciate her commitment to her work and she gives everything up to the reader in this very personal story. Check out her website for samples of her work. Diana has a nice back catalog of minis available and she's a very consistent and honest artist. Tthe Rosie Stories is still available for $3 from her website. The Chunky Gnars by Chris Cornwell For those of you lamenting the early demise of Cold Heat in pamphlet form, you'll be happy to find Chris Cornwell's salute of sorts - The Chunky Gnars. 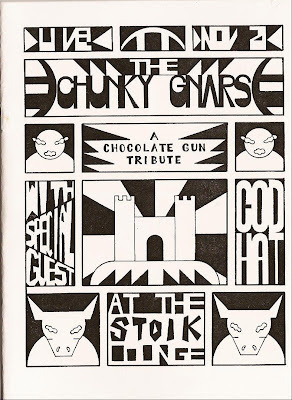 The cover of Chris's mini takes the form of a flier for a Chocolate Gun tribute band called The Chunky Gnars. 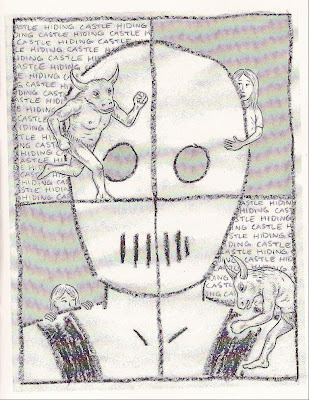 Inside you'll find a tight little story starring Castle and the ultra creepy Senator Wastmor. The Senator is still pissed off and hopes to use the lead singer of The Chunky Gnars for revenge. Over 16 pages, Chris does his usual fantastic job of mixing up panel structure and patterns, moving effortlessly from four or six panels to 36 tiny panels of silent images. The story feels comforting and familiar to Cold Heat readers and Chris is talented enough to play with the characters in a way that doesn't feel cheap or inappropriate. If you're infamiliar with Chris's work, check out his stuff on the Locals Rule page at Pittsburgh's Copacetic Comics or past reviews here at Size Matters. 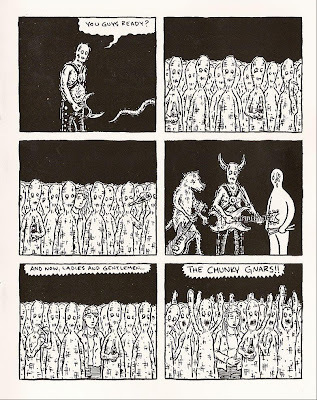 Get your own copy of Chunky Gnars from the Picturebox website for only $3. I'm a film photographer, often switching between a Nikon FM2n, a Leica M6, an Olympus OM-1 (35mm film), and a Hasselblad 501cm (medium format film). I sometimes use a Nikon D90 (digital). My film photography website is Shawn Hoke Photography. Silkscreening Picto-Guide by Dan Z.